Tip turkey into a bowl with the thyme. Finely grate in the zest from the lemon and add a little seasoning. Use your hands to mix the ingredients well, then shape into 4 patties. Chill until ready to cook. Can be frozen for up to 1 month. 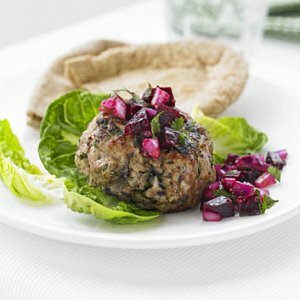 Mix the beetroot with the juice from ½ the lemon, onion, parsley, oil and mustard. Grill, griddle or barbecue the burgers for about 6 mins each side and serve with the beetroot relish, lettuce and pitta breads. Pour small amounts of the batter into a pan and cook like large THIN pancakes. Do NOT make them thick and heavy as too much carbs! They should be like paper wraps please. Place pancake on the plate, place the burger on the pancake and garnish with the relish. Shred lettuce and place on garnish. Can leave the pancake open or if you are able to fold it into an attractive looking parcel, with garnish spilling out slightly for presentation.